BACKTIME: Meet Your 2009 American League MVP? 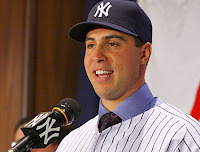 It shouldn't be that big a surprise considering the money the Yankees spent on Mark Teixeira. But, if you date back only 3 weeks, he was batting just .191 and frustrating a nation of Yankee fans, as well as his himself. His bat has rebounded in a big way, but the numbers aren't off the charts. His 16 HR and 44 RBI rank 2nd and 4th in the AL, respectively. His .279 average is a big step up, but the measurables don't begin to tell the story of Teixeira's impact. It's his intangibles that are leading the Yankees to their current perch on top of the League. He is a 2-time Gold Glove winner and the best defensive player on a team that just posted a Major-League record 18-game errorless streak. First Base is usually a position where you hide one of your best hitters, but Teixeira adds that extra dimension, which is what makes him so valuable. And he may have had his defining moment in last night's win over his former team. If you see the final score, it looks like a 12-3 romp for the Bombers. 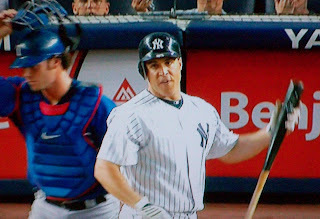 If you look in the paper, Mark Teixeira went 0-for-3. He didn't score a run. He didn't drive one in. But if you look closer, you'll see he was hit twice by the Rangers' Vicente Padilla. The second time was a little too obvious. 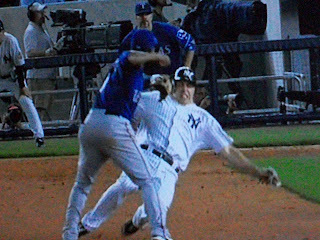 But instead of charging the mound, Teixeira took care of it the old-fashioned way, breaking up A-Rod's potentially inning-ending Double Play. Teixeira's fire and determination kept the rally alive and helped turn the 3-2 deficit into a 9-3 lead, and there's no trace of it in the box score. His play, and most importantly the way he plays, is what makes the Yankees a different and better team in 2009. And as the Yankees separate from the pack as the summer wears on, he may very well be the ringleader.